As a special preview of the project, here’s a letter from Glenn Kaiser to his mother, Jennie Holbrook, written 100 years ago today. 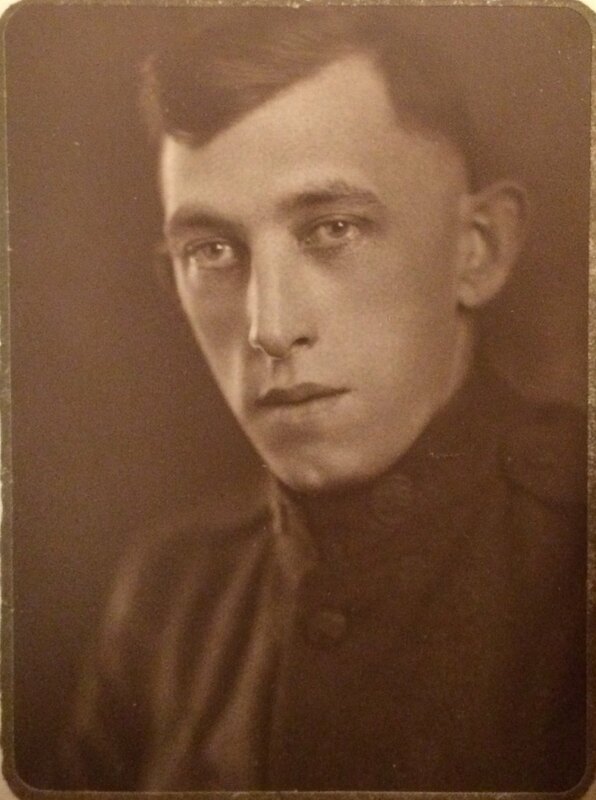 When Glenn was drafted in September 1917, he had been working at his father’s tinning shop in DeKalb. He was drafted into the 127th Infantry, 32nd Division of the Army. When this letter was written, his division had just been back from the front, and had retreated to safety in somewhere in France. This letter expresses his relief at being away from the front, and seems optimistic about the course of the war. He responds to the news that his brother Floyd is thinking of joining the military. He encourages Floyd to join the Navy instead of the Army, because he feels that the conditions of the soldiers are better. He also mentions his sisters Kate and Anna. This letter is also the only letter in our collection that was censored by the military before it was delivered to the states. I’m guessing he mentioned a specific division of the Army, and their location was not common knowledge yet, so it was cut out of the letter. The full transcription is below the images of the letter. Enjoy! As I am back from the Front lines I will let you kwon [know] that I am feeling fine and hope that you are the same. of the lines and as far as a man geting killd, he will die when hes time cames and not befor. there is no one know as well as I do so tell him for me to join the navy if it is the last thing he does but if I know any thing about this war he will not have to came over here but if he want to come let him because the more we have the marry it is. If you have been loking [looking] at the paper you will see what the [LINE CENSORED] been doing to the german. the germanes will not figth [fight] they are all in down and out so you can see it will not last long. Well this will be all for this time. hop you all are well. Click here to see the other letters that Glenn sent during WWI! More letters will be added in the next few months! Kaiser, Glenn, letters, originals, 1918-1919; Kaiser Family papers, privately held by Emily (Drake) Weil, Kingston, Ill.
Next Post Where is Conrad August? What a wonderful resource you have and I look forward to reading more of Glenn’s letters. It is very illuminating to get a picture of the war from a German soldier’s point of view, and thank you for all your work in making them accessible to us. Thanks Susan! His father was born in Germany, but Glenn was in the United States Army. He never spoke about it, but I wonder how he felt in his father’s homeland! Congratulations on your 50th post! I look forward to reading more of Glenn’s letters. What treasures you have! Enjoyed reading this letter very much. Always so interesting to get a look at life during the war. Congrats on your 50th blog post! I absolutely love this. These provide so much insight and detail about what they went through and sacrificed. Thanks so much for sharing. I’m sharing letters as well, one collection from my gr, gr grandfather written in 1889. We–you and I–are so lucky to have them. Great post. Wonderful to have the letters, I look forward to reading more of them. Thank you for sharing. Wow! You are so fortunate to have these letters at your disposal! It’s even better that you are willing to share them, mistakes and all (the mistakes add so much character).. I have some from my grandmother’s family in Austria, but they are all in German. I thought I could translate them, but it turns out that I have to learn to decipher German manuscript first. Bummer. One step at a time, I guess!